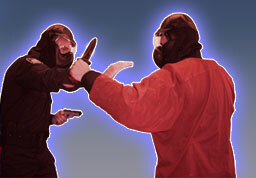 The Shocknife SK-2 is revolutionizing the edged weapon training industry. The blade of the Shocknife delivers a powerful shock that causes pain but no injury or incapacitation. When trainees are attacked with the Shocknife SK-2, there is pain stimulus like a real attack. This causes the same mental and physical state the trainee would be in during a real attack. The introduction of less lethal training ammunition in conjunction with mass education of the need for stress exposure training has pushed police training to its highest level in recorded history. Today it is hard to find a legitimate police academy that does not deliver reality based scenario training as part of their curriculum. Until now, their was no way to deliver realistic edged weapon scenarios as the use of rubber, wood or plastic knives did not create the acute stress needed to replicate a real world knife attack. This has changed with the introduction of the Shocknife SK-2. Want to make the dynamic training even more stressful? Delivers a full 7,500 volts! Ensures most realistic edged weapon training ever.